I am torn, torn between to paint effects. I will soon have the pieces painted flat black like I want them, but I need something else on there to make them pop! I have two styles in my head, one is 'ghost flames' and the other is pinstriped. Choice A below are the ghost flames, although the ones in the picture are more visible than the ones I will use. 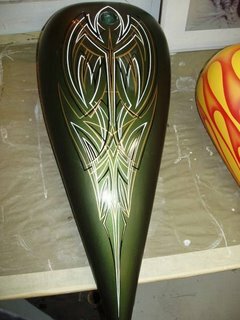 Choice B below is a great example of some really nice pin striping. In the comments section of this post, please choose A or B, to let me know what you guys think. It's obvious what I would choose... Yes indeed.. B... everyone else has flames, I mean how YAWN! This poll is tilting the way I want it to. Admin, you think chics are gonna dig this bike? I do believe it is Unanimous. Good choice all. I'm partial to the ghost flames. If you want to be really old school, bring back a Beard style lace paint job! The flames are cool...but I definately like the stripes better.